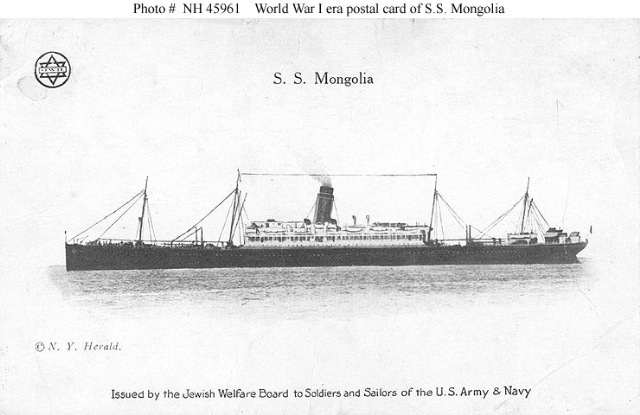 Back in June 2007 as a result of reading a post at the Marmot’s Hole, I posted a brief history of the USS Mongolia – initially a mail steamer on the Pacific run then later the ship with the honour of having fired the US Navy’s first shot in anger in World War I – all in a ship named after a land-locked country. I was reading some old Australian newspapers and I came across an article about the New Mongolia, a Peninsular and Oriental Steam Navigation Company (P&O) steamer which lead on to a search and an article in the New York Times dated 19 September 1906 titled “To Save The Mongolia” concerning the original SS Mongolia. Apparently there was a backlog of passengers wishing to travel across the Pacific stuck in Honolulu as a result of the SS Manchuria (sister ship to the Mongolia), a Pacific mail liner and the SS Sheridan, a transport, being stranded near Honolulu. This was compounded by the salvage operations needed by SS Mongolia which had struck a reef near Midway Islands all within a month. A further vessel, the SS Buford, was supposed to leave Honolulu for San Francisco with passengers when those sailing orders were cancelled and she was instead ordered to sail to Midway to collect the Mongolia’s passengers and bring them back to Honolulu. It seems that none of the captains liked sailing to Midway because of the reefs in that area. The most powerful tug in the Hawaiian Islands, the Iroquois, was due to sail to Midway as well on the 20th of September to tow the Mongolia off the reef.